A rocky promotory overlooks a calm bay on San Juan Island. This single story volume keeps a low profile while taking advantage of the stunning views. 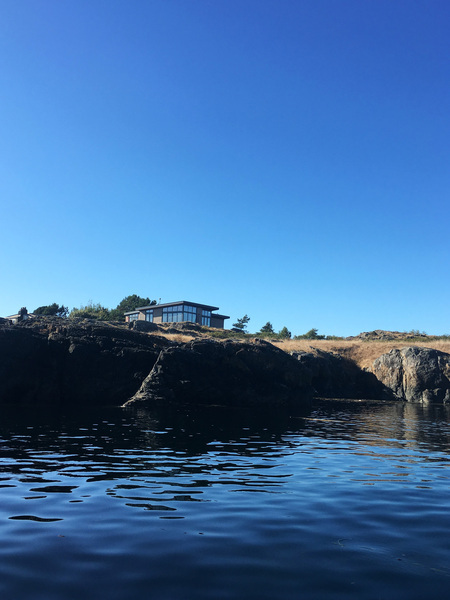 From the water, the naturally aged gray cedar siding blends into the rocky shore so that the house becomes an outcropping, defined by the dark line of its roof. A bright wall, visible only from the road as you approach, invites visitors inside. Maintianing a low profile on this restricted site was a planning and programming challenge. The result is a highly efficient floor plan with minimal square footage allocated to "pass through" spaces. To bring a feeling of expansion and openness to the interiors, we angled the Southern wall of the combined Kitchen/Dining/Living room and set the roof pitch to open towards the best views. As a result, the floor to ceiling windows and sliding doors let in warm Southern light while framing expansive views of the peninsula and water. Careful space planning facilitates a conservative project budget. Keeping the volumes, details and materials simple yet elegant has yeilded a competative SF cost for the project while not sacrificing drama or delight. A muted tonal palette of primarily grays, whites, and charcoals is balanced with the warmth of white oak wood on cabinetry, doors, and the living room ceiling. Moments of color pop against this backdrop, and the richness of the exterior landscape enters the interior visual realm more deeply as it is not outcompeted.